Hey kids, why not create a colourful strawberry tower which in a very short time will be dripping with delicious berries. Strawberry ´Lowanna´ Large fruit over a long season. Bred for Aussie conditions. Strawberry ´Supreme´ Sweet, firm fruit early in the season. Higher in Vitamin C than other varieties. 1. 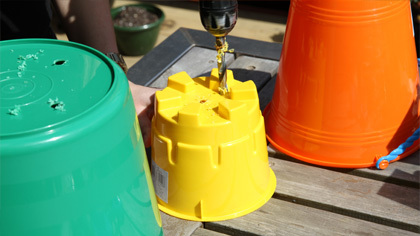 Ask an adult to help you drill holes in the bottom of your buckets for drainage. 2. Half fill the largest bucket with potting mix and place the middle size bucket on top. 3. Plant the bottom bucket with strawberries, topping up the sides with potting mix as you go, so that there is a ring of strawberries around the middle bucket. 4. Now fill the middle bucket roughly half way with potting mix and place the smallest bucket on top. 5. Repeat step 2, only this time plant a ring of strawberries in the middle bucket. 6. Finally, fill the smallest top bucket almost to the top with potting mix and plant it out with strawberries. 7. Place your strawberry tower in the sun. Water and liquid feed regularly and you´ll be rewarded with a cascading tower of strawberries, so sweet that you can eat them straight off the bush!